What was once Stow Field, a small airport in a rural community, stands at the center of this story. 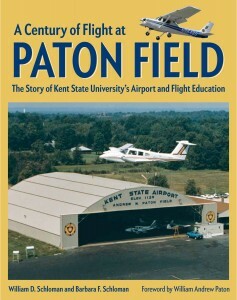 Kent State’s participation in the federal government’s Civilian Pilot Training Program in the years leading up to World War II led to state funding for purchase of the airport and prepared the way for the creation of collegiate aviation. 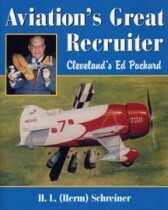 This brought in Andrew Paton, who created the first flight-training curriculum and established a vision for the role the airport could play in a university-run program. In the period between the two World Wars, Stow Field was also the site of aviation exhibits that drew as many as 80,000 people, including the christening of Goodyear’s first helium blimp. As Kent State’s airport is now enjoying both a new vitality and long-awaited investment, William D. Schloman and Barbara F. Schloman place this in context with the at-times-uncertain survival of Kent State’s aviation program. This comprehensive history will appeal to graduates of that program and all aviation history enthusiasts, as well as those interested in the history of the region more generally. AuthorsWilliam D. Schloman grew up under the traffic pattern of Paton Field in Stow, Ohio, and now resides under Practice Area 5 used by KSU student pilots. He is a graduate of the Kent State flight program, a former airline captain, and presently a flight simulator instructor. Barbara F. Schloman is professor emeritus and former associate dean of Libraries at Kent State University. Along with the aviation enthusiasts in her family, she has enjoyed many air shows and aviation museums.